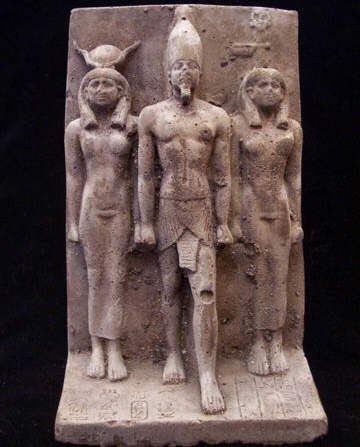 Egyptian King Menkaure Triad "4th Dynasty"
Sold on eBay by seller "D"
We are a family that adores Egypt and what ever comes from the land of pharaohs. We have been collecting a huge collection of Egyptian artifacts from other collectors and private auctions. And now, we have contacts with several Egyptian dealers who work in the excavation field since 1976. We do our utmost to provide you with the most accurate dating and time guidelines on all of our items. We don't guarantee this items exact age as we don't have Carbon Dating, nor chemical analysis Abilities, therefore we can not verify the exact age, time frame of our items are suggestive. 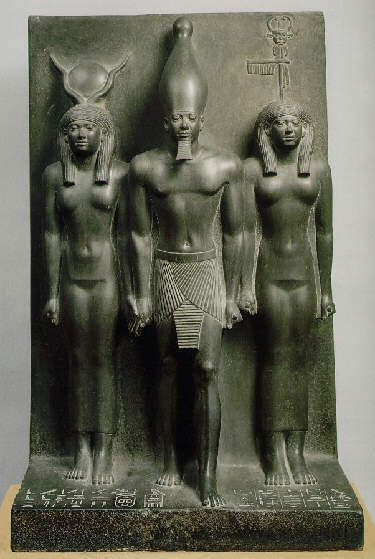 This triad shows the figure of Menkaure, Hathor (on his right), and the deity of the seventh Upper Egyptian nome (on his left) at almost the same height. The three youthful bodies and their spare accoutrements are worked with an almost metallic precision. 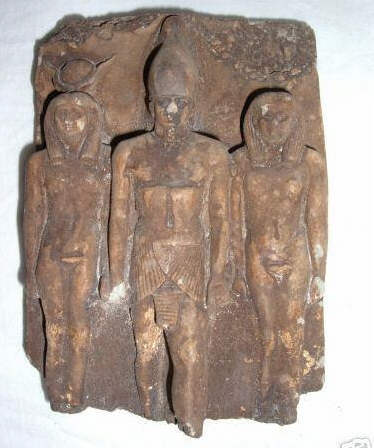 The two female faces are shaped according to a general ideal of the feminine beauty, while the king has the bulbous eyes and drooping lower lip known from his other image ,Made From stone,during Dynasty 4, The detail is symbolic to the artistry displayed by the ancient Egyptian craftsmen.pruched from An antique dealer. We don't guarantee this items exact age as we don't have Carbon Dating,nor chemicle analysis Abilities. This is solely Due to high cost and possible damage to the items and the known fact carbon dating is done only on materials once living And therefore we can not verify the exact age time frame of this PIECE down to the exact Dynasty, year etc. For this reason we start with a low cost and with no reserve! I obtain my items from various well known and legitimate sources (antique dealers some of those dealers have been working in this business since 1930's and 1940's) private collections and or estates), We have received all information regarding our items from second hand sources, and the timeline set on our items is to be used as a guideline for the above period listed. GO TO NEXT PAGE AND SEE MORE FORGERIES!! !